The British Museum opened in 1753 and has prided itself on remaining free for all that time. The British Museum houses more than an incredible 7 million objects and it would probably take a week to see everything. The collection of Egyptian and Greek antiquities are without a doubt amongst the largest and best known in the world. Part of the collection consists of the controversial Elgin Marbles, brought back from the Parthenon in Athens by Lord Elgin, whilst he was serving as Ambassador to Constantinople at the beginning of the nineteenth century, and subsequently bought for the museum by the English government. Check out the Free Family Day Out in Central London that starts at the British Museum. 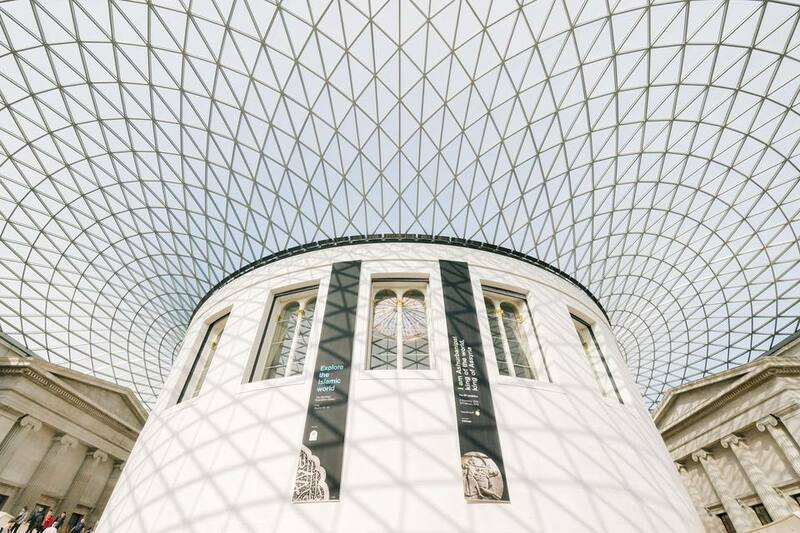 When planning a trip to the British Museum, also check out Museum Mile to see the other museums in the area. For more information, see the British Museum Getting Here page. Free admission every day from 10 am to 5.30pm and open late on Fridays until 8.30pm. The museum is closed on 1 January and 24-26 December. For more information, see the British Museum Opening Hours page. Entrance to the Museum is free, although a suggested donation is requested (£3, US$5, 5 Euros). Some events and special exhibitions have an admission charge. For more details see What's on on the British Museum website. Book online, at the Ticket Desk or call: 020 7323 8181. The Museum has four shops where you can buy books, souvenirs, family gifts, and luxury products. Don't forget to buy your Rosetta Stone souvenirs including paperweights, a rucksack, and chocolate! Souvenirs, replicas, guides, postcards, jewelry, stationery and inexpensive gifts. Games, books, DVDs, puzzles, souvenirs and educational items for children of all ages. Luxury items including replica sculptures, jewelry, silk scarves, and ties. Books specializing in ancient history, archaeology and art history. Many titles are written by curators. Find out more about the shops at the British Museum on the official website. The main entrance on Great Russell Street has steps but there are also open-air, self-operated lifts/elevators either side of the steps. At the back of the museum, the Montague Place entrance does not have steps and is at street level. The majority of the museum can be reached by lift/elevator. There's a lift by each entrance and two lifts in the Great Court. Pick up a free plan of the museum when you arrive to help you choose the right lift for your destination. You call ahead if you have special requirements or questions on tel: 020 7323 8299 and you can check the Access page on the British Museum website for the latest details. There are free activities and resources for families every day at the British Museum. Go to the Families Desk in the Great Court and ask for the Activity Trails which take up to an hour to complete. There are choices of topics and age ranges. If the children are feeling artistic, you can borrow crayons, pencils, and pads from the Families Desk in the Great Court. There are daily free handling sessions so check the map and touch a piece of history. The Children's Multimedia Guide is available for a small fee and has a selection of tours to try around the museum depending on your child's interests. At the weekend there are Gallery Backpacks available for free (but leave a £10 deposit). These have games, dressing up items and activities for a range of ages too. Children 7+ can join the Digital Workshops every weekend, and there's an extensive calendar of holiday time activities available for all ages. Visit the Family page on the British Museum website for more information. The British Museum cafes are great for families but if you want an alternative, East Street is under ten minutes walk away (just off Oxford Street) and has noodle dishes. Kids love the Japanese cartoons projected on the back wall and the crayons brought to the table and everyone can enjoy the cinnamon ice-cream. Membership assists acquisitions, conservation, and new technologies and above all ensures that the incomparable inheritance of the British Museum continues to change lives. There's a junior membership too (Young Friends 8-15) which gives you access to join sleepovers within the museum. You can also find out more about The American Friends of the British Museum at their official website. These short tours (30–40 minutes each) introduce different areas of the museum's collection, led by volunteer guides. They are daily, so check the timetable to plan your visit. These guides are available for a small fee and have a detailed insight into over 200 objects in 61 galleries. There's an audio commentary along with images and an interactive map. It is available in 10 languages. The collections at the British Museum are vast and you could walk around for days and still not see it all. If you want to make sure you see the key exhibits, have a look at these British Museum highlights that can pencils, in a couple of hours. Also recommended is the British Museum Highlights Tour which takes you "around the world in 90 minutes".